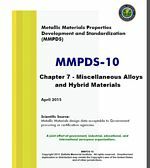 The Metallic Materials Properties Development and Standardization (MMPDS) Handbook, is an accepted source for metallic material and fastener system allowables recognized by the Federal Aviation Administration (FAA), all Departments and Agencies of the Department of Defense (DoD), and the National Aeronautics and Space Administration (NASA) within the limitations of the certification requirements of the specific government agency. This chapter contains the engineering properties and related characteristics of miscellaneous alloys and hybrid materials. In addition to the usual properties, some characteristics relating to the special uses of these alloys are described. For example, the electrical conductivity is reported for the bronzes and information is included on toxicity of particles of beryllium and its compounds, such as beryllium oxide.